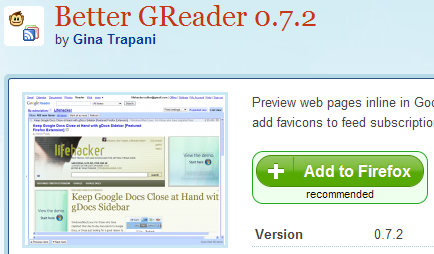 Just released an update to my Firefox add-on, Better GReader 0.7.2, which contains a few fixes plus a new integrated print button. Huge thanks to the folks at Mozilla for making Better GReader one of their official “Recommended” add-ons; it’s now got over 33,000 active daily users (relatively small compared to Better Gmail 2‘s 304,000 daily users). As always, a lively conversation about all the Better Webapps add-ons is going on on the mailing list. Hit us up with questions, problems, or requests there. Download Better GReader and let us know what you think. My favorite feature: “Preview Item,” which loads the originating web page right inside Google Reader. This is awesome. One weird thing though: does it make any sense that when Better Greader 0.7.3 is active in firefox, the google reader tab constantly tries to hit http://www.bing.com? It stops as soon as I disable the plugin. Anyone have any thoughts about why that would be? is it possible to use this with my fluid ssb? Its not on openscripts, and I can’t figure out how to import it.